Neighbors helping neighbors is a proud tradition in the western Great Plains — from community barn raisings to moving cattle. Prescribed burn associations are a modern manifestation of that long-lived pioneer tradition. They are composed of ranchers and farmers, and their neighbors, relatives and friends who work together to bring back another ancient tradition, fire, which has long been a part of maintaining the natural balance of the prairie. 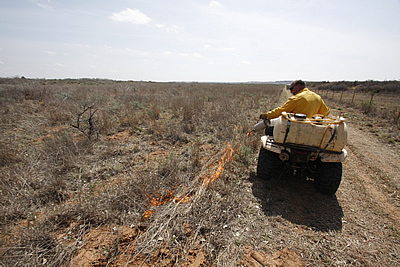 Today, these burn associations use fire to restore native prairie vegetation that supports grassland dependent species, reduce woody invasive plants that take water and nutrients from native plants, and reduce high fuel loads across the plains. Prescribed burn associations range in size from a handful of ranchers to much larger numbers of cooperating agricultural producers. Group members learn the safest methods to use and control fire, when to apply it for the desired vegetative result, how often to apply it to the land, and how to graze when the new grass grows lush and healthy. They also take classes on plant identification, proper grazing techniques, fire weather behavior, fuel load estimating, fuel type burning rates, smoke dispersal patterns and how to write burning plans for their land. To educate the broader community, associations hold demonstration burns, conduct field days to show effects of burning, and teach “hands on” burning classes for their neighbors who want to learn how to properly apply fire. PLJV supports prescribed burn associations because prescribed fire is a cost efficient tool to restore our prairies to an almost natural state in terms of both plants and animals, including the bird species that rely on these grasslands. PLJV helps prescribed burn associations find grants for funding and build partnerships with agencies and organizations that have similar habitat goals. To burn, proper equipment — such as drip torches, spray units, ATV’s, hand held radios and fire resistant clothing — is needed. Most landowners don’t own all the equipment themselves. That’s where the association helps. Prescribed burn associations, or individual members, may own some equipment, applying for grants to buy it or manufacturing their own, borrow from other associations, and make deals with partners like Pheasants Forever, National Wild Turkey Federation, or state forest services to use their equipment. Grant funds also help association members to become trained as fire practitioners and to train other agricultural producers and landowners to use this economical way of restoring and maintaining the prairie. There are now 17 prescribed burn associations in Oklahoma, eight in Kansas, 10 in Texas and 12 in Nebraska. Each of those states also has an advisory group, called a state prescribed fire council, to help educate, train and equip the associations. Recently, a regional prescribed burn association has been formed, which includes those four states with interest from New Mexico and Missouri in joining the group.